ready to signify to walkers, boaters and cyclists that something was going on. 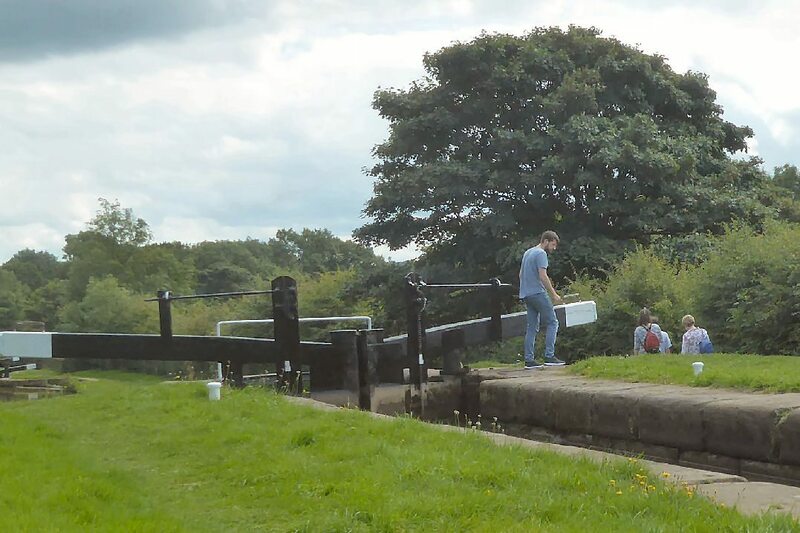 The Something was HALOUS, the annual event organised by Macclesfield Canal Society during which all twelve locks of the Bosley flight are manned by volunteer lock operators. On Saturday morning volunteers assembled for a pre-HALOUS briefing before dispersing to their stations along the mile-long lock flight. Pitched at lock 5 were displays mounted by the Canal Society and a tent selling books and bric-a-brac, cakes and canal souvenirs. Trade was brisk throughout the two days and a colourfully decorated donation box attracted funds for the Canal Society. The Captain, recalling that the weather during last year’s HALOUS event was rather damp, manfully lugged a dome shelter from Cleddau’s mooring at the bottom of the locks up the hill to pitch it beside Lock 9. If not shelter from rain (was the theory), then it might provide shelter from beating sun. Oh, in the heat on Saturday, how the flies loved it! Taken uphill too were chairs, windlasses various, life jackets, walkie talkie radios and refreshments. An innovation this year was the provision at each lock of an emergency rescue throw line to help anyone in the water – thankfully not needed. Between 0930 and 1600 on Saturday the crews of 23 boats were helped up or down the locks. Up came Rosie, a colourful boat which is usually moored outside Teapot Hall, at Scholar Green. Her bottom had recently been blacked and she made a fine sight. From the front deck a bowl of biscuits was proffered – a kind gesture that gave a welcome boost to energy levels! When the boat was fully raised the helmsman stepped off the stern, eager to shake hands with the paddle winders and gate pushers. 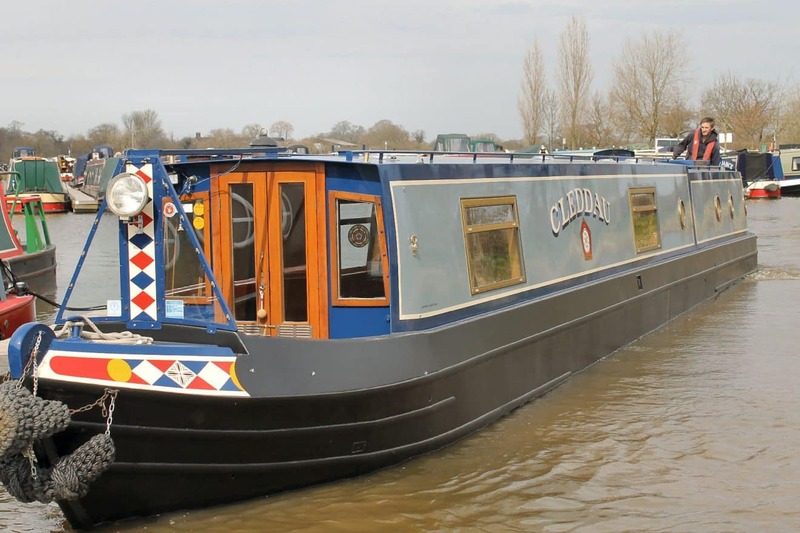 There were narrow boats, cruisers and Takara, a hotel boat. All day radio messages between the lock volunteers relayed each boat’s progress from lock to lock. “Please give us tuition,” pleaded the novice crew on Hazelhurst, a hire boat. 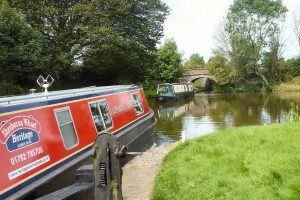 Boaters’ stories emerged: cruises in distant parts… medical needs keeping would-be boaters away from the cut … the tales behind boats’ names… In the hot sunshine dog walkers, locals and Macc Society members trotted up and down the hill. Mid-afternoon a multi-generational family group paused and gazed over towards the Dane Aqueduct. Sunday dawned, a second sunny day on an August Bank Holiday! Trudging up the towpath to report for duty at Lock 9 was no hardship when from somewhere not too far away church bells began ringing for Sunday service. Until reinforcements (Cheshire Mum, Cheshire One and Cheshire One’s Best Friend) arrived from Macclesfield the Captain and Boatwif had responsibility for both Locks 8 and 9. No problem, until it became apparent that an upcoming boat was approaching an unmanned Lock 10… Three locks, two lock keepers, no sight line between Locks 8 and 9, variable radio reception… Cooperation between team members saved the day. Doing the locks was really fun. My best friend and I really enjoyed the experience and my best friend got to go on a canal boat for the first time. It was really tough as well though. Some of the paddles were really stiff and hard to operate but they got easier the more we did it. The two days wore on: radio operators tried to deliver crisp and concise messages though occasionally some wry humour could be detected over the airwaves. and the Society coffers were replenished too. Society members picnicked and socialised: all in all it was a grand way to spend a bank holiday – indeed the sun shone throughout, what more could one want! By Sunday evening Cleddau had been de-flagged and readied for a return to normal cruising.